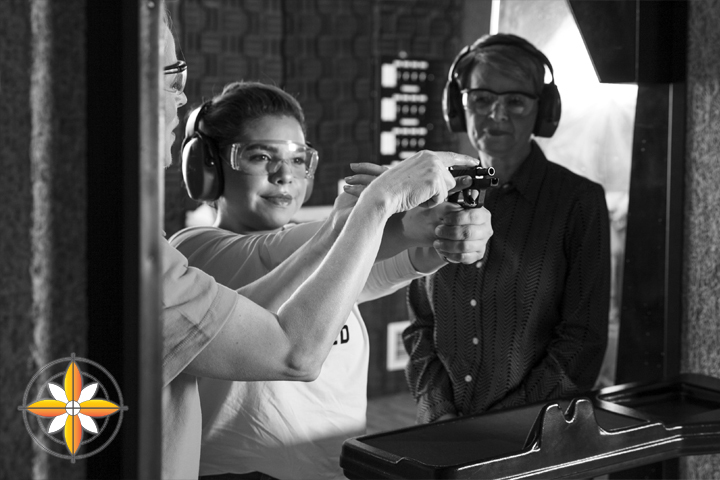 We offer classes for every level, for women interested in understanding the proper methods of firearm operation and self defense. Our classes are designed primarily to meet the learning styles – physically and emotionally – of women. Each class has a size limit so everyone can get the individual attention they desire. 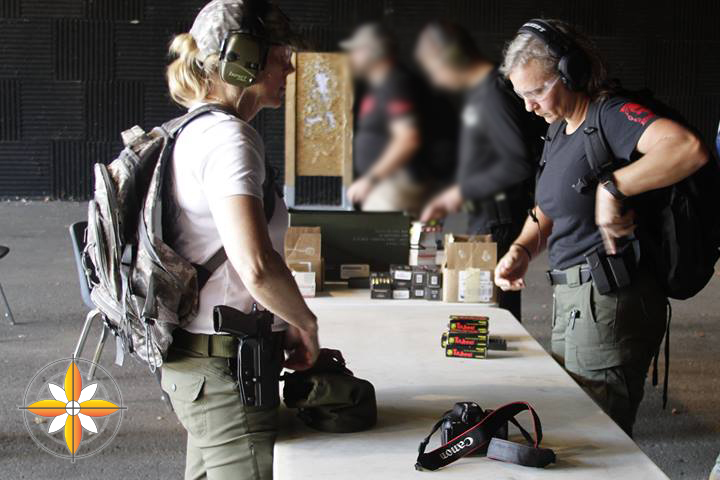 This basic skills class includes hands-on classroom instruction and time on the range. Students learn the essentials of safe firearm operation, choosing the right ammunition, grip, aim, trigger control, and basic maintenance. Safety is emphasized throughout. Small classes mean lots of one-on-one time with your instructor. All range fees, materials and equipment are included. 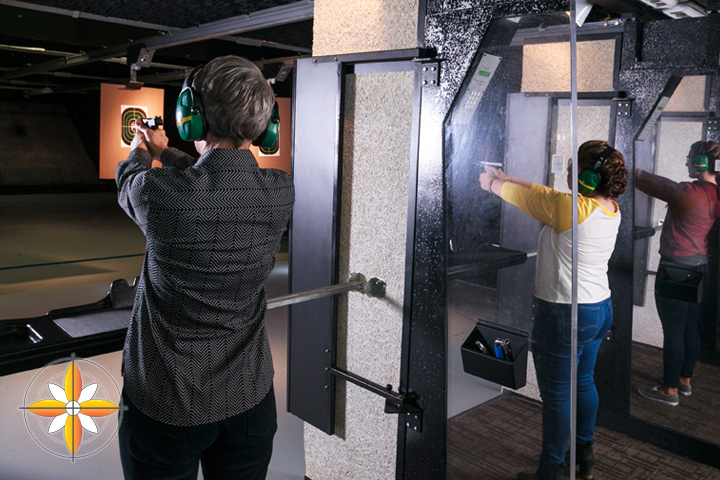 This self-defense oriented class is designed for women who are new to handguns. Hands-on classroom instruction introduces students to marksmanship fundamentals and personal defense strategies. Live fire drills reinforce technical skills and decision making. Safety is emphasized throughout. All range fees, materials and equipment are included. Limited to 12 students. Women only - 21+ years old. Students will address multiple targets, building speed, accuracy and judgment through timed drills. For more experienced shooters. Range fees and materials are included. Use your equipment or ours. This course provides five hours of combined classroom and firearms simulator-based training exercises. Students build on their marksmanship fundamentals, developing simple defensive tactical skills and situational awareness needed to safely operate a pistol for self and home defense. No live fire. Students will use an advanced indoor, video-simulation system usually available only to law enforcement. Practical legal and ethical issues will be covered in a virtual shooting environment. We offer special and seasonal events that focus on specific training for women. This 3-hour event will bring out the inner Astrid inside each student. The class will explore important physical, mental and emotional health factors that support safe firearms operation and influence our reactions to a shooting incident. Through integrated classroom and live fire instruction, students will practice empowering awareness, relaxation, and centering techniques. This 3-hour event explores important physical, mental and emotional health factors that support safe firearms operation and influence our reactions to a shooting incident. Through integrated classroom and live fire instruction, students will practice empowering awareness, relaxation, and centering techniques. This is a class for women of any level of fitness who want to learn how to incorporate every-day self defense techniques with a variety of exercise disciplines. Bring a towel and/or yoga mat, lightweight sparring gloves, resistance bands, or no equipment at all! Classes adapt to students' interests. It really is a mash-up, making each Tuesday class unique and lots of fun!